Happy New Year From ZCC. Following our last ‘Christmas Outreach’ mailing, we thought you might appreciate an update on how things went. So please find some headlines below. On Saturday 2nd December, when the town hosted a number of Christmas themed events, we were able to give away over 100 copies of the book ‘The Greatest Gift’, along with hot chocolates, and invitations to our Christmas services. People were receptive to the offer of a free drink on a cold day and the outreach was well received. 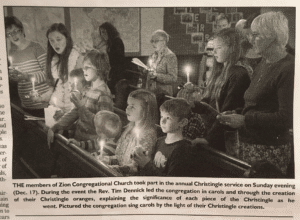 On Sunday 17th December we had our annual Carols & Christingle Service, and were delighted with the turn out with about 50 people there, of which we estimate about twenty of those were local non-Christians, many of whom had never been to Zion before. The service seemed to be appreciated by all, and was covered in the local paper – see below. Some people expressed an interest in returning in the new year. (Photo credit: Tobi Carver, St. Ives Times & Echo). Our Christmas Eve service was again well attended by a number of non-Christians, including both local people and an international student from China. The daughter of two of our members very kindly cooked lunch for everyone which was delicious and much appreciated by all. On Christmas day we had visitors with us as well. Please join us in giving thanks to God for a busy but encouraging Christmas period. There were numerous answers to pray and God provided all that we needed. I (Tim) was particularly encouraged by the hard work of the church family in doing the outreach, making invites, organising the services and welcoming guests. We were also supported by other Christians from the town, for which we are very grateful. Please pray for us as we seek to have follow-up conversations with those who came and as we think about Easter and encouraging those who came at Christmas to come again. – we are in the process of getting our mid-week groups up and running again; Anchored (10-15s), Tuesday Club (5-10s), our fortnightly prayer meeting and home group. – the bookshop is closed for January, to give the volunteers a rest and to enable a stock-take to happen. – plans are underway for work with the Sierra Leone Mission, there is a fairly continuous stream of goods that arrive, including about £15k worth of school uniforms which were recently donated. – we hope to make some improvements to our buildings this year; to carry out some essential maintenance, to improve our appearance in the town, to make them more accessible and to improve fire safety. As ever, please keep us in your prayers that God would be glorified through everything that is happening. We hope to see many of you this coming year. Tim & the members of Zion.